Diorite is modern face built on classical letterformsbut left with a bit of residual roughness. Some might call Diorite forthright, others brutal. (It reminded the designer of the dark, hard igneous rock of the same name, treasured by the ancient Egyptians for statuary.) 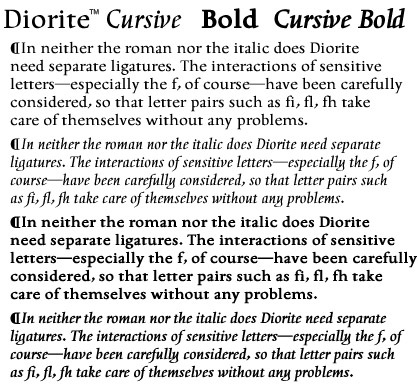 The typeface has a relatively chunky, four-style family; the italics are true cancellaresca corsiva, also writ heavy. “The cancellaresca is of course a Gothic design,” notes Lars. “Just use a broader pen, and you’ll see!” Has four styles: regular, bold, cursive, and cursive bold. US$85.